If you have had sinking or settling around your home over the years and water now drains towards the foundation of the house , the task of correcting this can be quite overwhelming to a home owner. This is also one of the main concerns a home inspector will observe and recommend correcting before buying or selling a home. The reason is because major foundation problems such as cracked basement walls can occur if this problem is not corrected. The cost of repairing your foundation can be 10 times the cost of correcting the grade around the foundation.The most important thing a home owner can do is to clean eave troughs several times a year. If they become clogged with leaves or drip all along the roof due to aging, this is the main cause of excess settling around the foundation. New homes encounter settling for at least one year after completion. 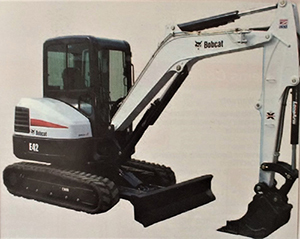 The back fill pushed around a basement cannot be packed properly with big equipment so up to one foot of settling is common in the first year. A good method to speed up settling and help ensure the majority of settling is complete before landscaping is to water the first 3 to 5 feet around the entire foundation. The best thing to use to do this is called a "soaker hose". Allow this to run for several hours in each area. If you are in no rush, let mother nature take care of this thru rainfall and snow melting. When regrading older yards we usually go 10 to 12 feet from the back or front of the house. On the sides we go from the house to the property line. Most of the time some excavation is required to match back to existing grades. We often use a mini excavator to do this. This specialized piece of equipment can fit through a 30 inch gate to access back yards that are fenced. Settling of yards is a common occurrence and some regrading can be required approximately every 10 years. This happens due to our extreme weather conditions. In wet, rainy years our soil has a tendency to swell as it absorbs moisture and when it freezes in the winter it expands. In dry years the moisture around our foundations evaporates causing the soil to shrink. If you have ever wondered why your gates don’t open or close the same way throughout the year, that is the reason. The same thing happens with sidewalks, patios and driveways. We would be pleased to come and assess your situation and provide you with a free estimate to solve any problems. Give us a call at 204-255-5560. 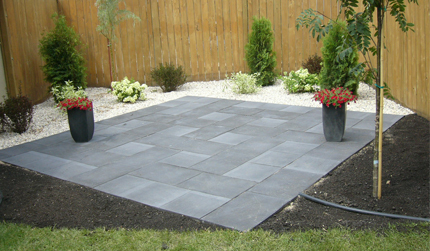 We are a Winnipeg based landscape contractor specializing in Low Maintenance Residential Landscape Construction. Our installation services include soil, sod, trees, shrubs and mulch to retaining walls, paving stones, patio stones and gravel driveways. We also specialize in renovating and re-grading of older yards. Complete New Home landscape installation from start to finish. Re-grading of existing yards to correct drainage problems. Landscape Consulting. Contact us anytime by email at krobert@mymts.net or by phone at (204) 255-5560 Monday to Friday from 8:00 am to 5:00 pm. We can often be reached 7 days a week during the peak season and we check messages frequently.